The word sashimi translates to ‘cut body’ and are thinly cut strips of meat which is consumed raw. This delicacy was introduced by China some 2500 years ago and has since become an important part of Japanese cuisine. Here we will cover the some of the popular sashimi types, how to make perfect slices, choosing a quality knife, a sushi vs sashimi comparison chart and how to eat it – the Japanese way! The key to cutting perfect slices is to cut 1/8 inch slices against the grain. It’s potentially dangerous and tricky but can be mastered with a good quality knife, some technique and a bit of careful practice. 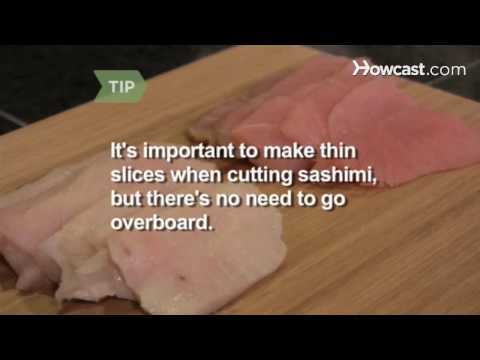 In this video you will learn how to cut perfect sashimi slices. Video is owned and created by HowCast. Sashimi, no matter the type, is just as much about visual presentation and arrangement as it is about taste. It’s recommended to be eaten the Japanese way – with chopsticks. The lightly salted delicacy is actually meant to be enjoyed without any condiments but its perfectly acceptable to have it with soy sauce and wasabi if one chooses. A sashimi platter is the ideal choice, especially for beginners, as it allows you to try out various types all at once. It’s common and actually recommended to have pickled ginger with your platter. The point is to consume small amounts of ginger in between trying out the different varieties as the ginger does a great job at cleansing your palate. The equipment needed to make the delicacy doesn’t need to be expensive. As a matter of fact, only a high quality stainless steel knife is all that is needed unlike the many items needed to make sushi. Below we will review 4 high grade stainless steel Japanese knifes that are ideal for the task. This high quality Japanese knife is made from surgical stainless steel and is twice as hard and tough than most other knife brands. It’s single edged and not made for chopping – instead it’s ideal for slicing which makes it the perfect sashimi knife. Check out this knife at amazon.com. This Japan made 10 inch multi-purpose knife features high quality carbon steel with a non-slip handle. It’s ideal for preparing fish, thanks to its unique shape which enables you to fillet an entire fish in one or two moves. The damascus stainless steel pro blade features an incredible 33 layers of stainless steel and allows you to slice through any ingredients without needing to apply much pressure. The knife is the most cost effective yanagiba blade money can buy and is a popular choice among chefs around the world. Check this knife out at amazon.com. A lot of people get confused when it comes to sushi and sashimi; so much so that some even can’t tell the two apart. However, there are differences between the two as you can see in the sashimi vs sushi comparison chart below. Calories Depends on the ingredients but sushi contains more calories and carbs because of the rice. Depends on the ingredients used but contains less calories and carbs than sushi. The varieties are basically endless – so much so that one could even surprisingly find horse, beef and chicken varieties. Below we will only cover the traditional Japanese seafood types. Most things are consumed raw when it comes to this delicacy and as well as sushi but not when dealing with eel. Most eel species have poisonous blood which is why it first has to be bled before being lightly grilled or cooked. Nevertheless, it’s incredibly delicious and has a similar texture to fugu (pufferfish). Octopus sashimi, also known as tako, is one of the most easily recognizable Japanese dishes. The thinly sliced purple colored flesh with suction cups tastes surprisingly delicious raw and slightly salted. Shrimp, also known as ebi is a delicacy in Japan. Tiger prawns along with red shrimp, botan ebi and amaebi are by far the most popular and delicious types. Squid, or Ika as the Japanese call it, is a popular choice. The flesh is see through and is rather chewy but has a unique sweet taste. It’s common for restaurants in Japan to have a tank full of live squid and they prepare it within two minutes right in front of you upon ordering. There is a wide variety of fish which are well suited for this type of cuisine. Tuna is by far the most common and most popular choice but other compatible fish types include salmon, halibut, mackerel, red snapper, yellowtail and sea bass. A word of caution: Mackerel is the least popular since many people do not like the strong oily texture and taste. Sushi is the most well known Japanese export and loved by many people..